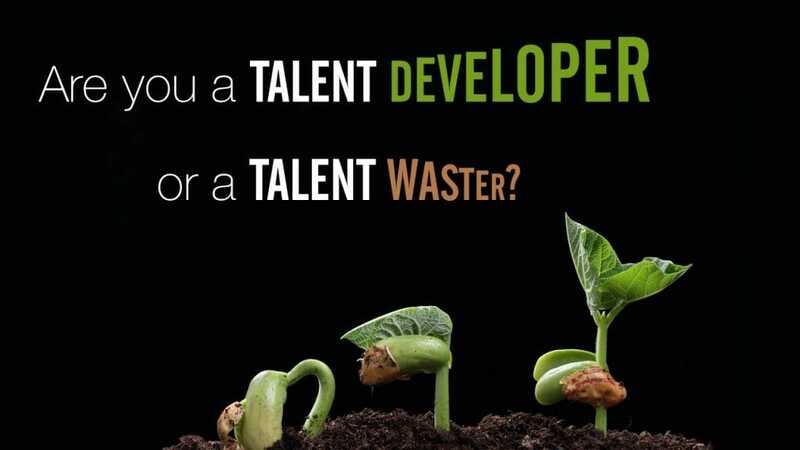 Are You a Talent Developer or Talent Waster? Few leaders have earned a reputation for being an exceptional talent developer… but they’re out there. These exceptional leaders didn’t just build organizations; they developed a new generation of leaders. Unfortunately, most executives and middle managers don’t think or act the way Superbosses think and act. Why? Probably because they barely have enough time to get their own work done, let alone make it their personal mission to develop a legion of future leaders. That might sound like a cop out, but it’s a reality in many cases. Most of us would love to consistently build the skills and capacity of those who work for us, but the urgent crises of the day tend to keep executives and managers in fire-fighter mode far more often than in capacity-building mode. Smart business leaders recognize this inherent conflict and they’re doing something about it. They are making leadership and career development an organization-wide priority and are putting a system in place to make it the cultural norm. How well does your organization develop it’s talent? The answer to this question is often the single most significant difference between industry-leading organizations, and mediocre ones. Go ahead and think of any industry-leading organization, and you’ll almost always find that leadership and career development is one of their top strategic priorities. Here are a few examples of industry-leading companies and what they do that demonstrates their commitment to leadership and career development. Marriott International has a custom leadership development program, as well as an internal mobility program that enables supervisors to gain hands-on experience in other departments to help prepare them for greater management responsibilities. Costco established Costco University where senior leaders facilitate discussions about difficult business issues and how to apply best practices to address them in the workplace. Most people at Procter & Gamble start out in entry-level positions and progress throughout the company in a variety of roles because P&G “hires the person, not the position.” This means that employees can experience a range of different responsibilities depending on their interests and talents. Google developed the “Career Guru” program where employees can enroll in highly focused and confidential career conversations with senior Google leaders. 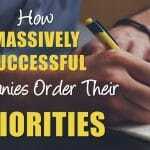 The industry-leading companies highlighted above are all massive companies with huge budgets. So how can average companies become exceptional talent developers? I mostly work with mid-sized companies that aspire to greatness. They don’t have massive budgets for training and development, but they want to make the most of what they do have. I show them that becoming a world-class developer of talent doesn’t take a lot of money, but it does take strong desire and discipline. As great as that sounds, it’s still not good enough to become a world-class talent developer. Succession plans tend to focus on about 20% of the workforce—the handful of people who want greater leadership responsibility and who are demonstrating the leadership characteristics which are considered most important in their company. What about the other 80% of their employees? Are they less worthy of developing? 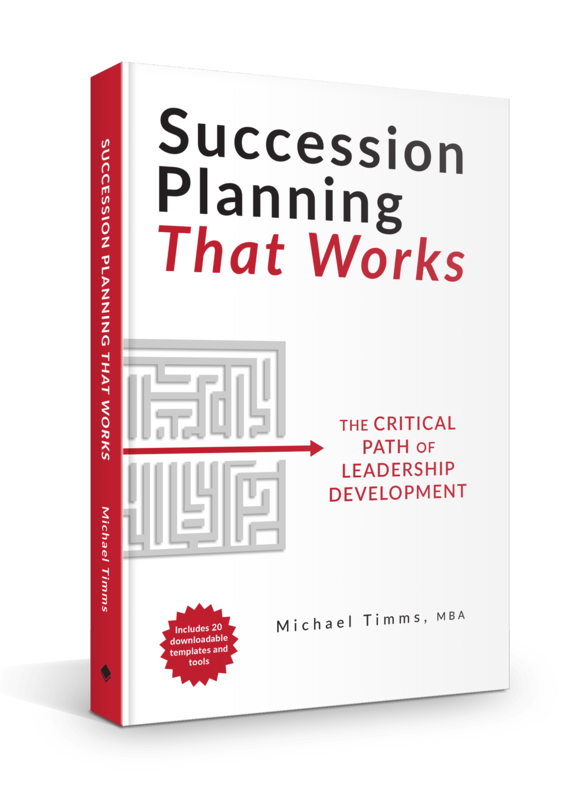 World-class talent developer organizations implement the mechanics and best practices of succession planning, and then expand aspects of the succession process to include all positions. This way, all employees receive a rigorous development plan, while the organization can focus strategic energy and resources on the few employees who are the most prepared (at any given time) to take on greater leadership responsibility. And by the way, this doesn’t take much money, just the corporate will to make leadership and career development a top strategic priority. Average companies tack career development discussions onto the last section of the annual performance review. World-class talent developers make career development discussions a separate process. Think about it. Performance reviews are backward looking. Career development discussions are forward looking. They are distinctly different discussions that deserve enough time to thoroughly discuss each. 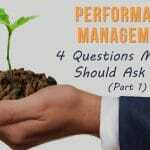 Typically, the very last section of the performance review is the Career Development section. By the time the manager and the employee have slogged through the performance review and get to the last page, they’re exhausted. So the manager suggests, “Why don’t you just take a course on effective communication.” The employee heartily agrees so they don’t have to spend another minute in the diabolical torture test known as the “performance review”… and they’re done! Phew… glad that’s over with! I have never seen anyone’s career development be fast tracked using this approach. 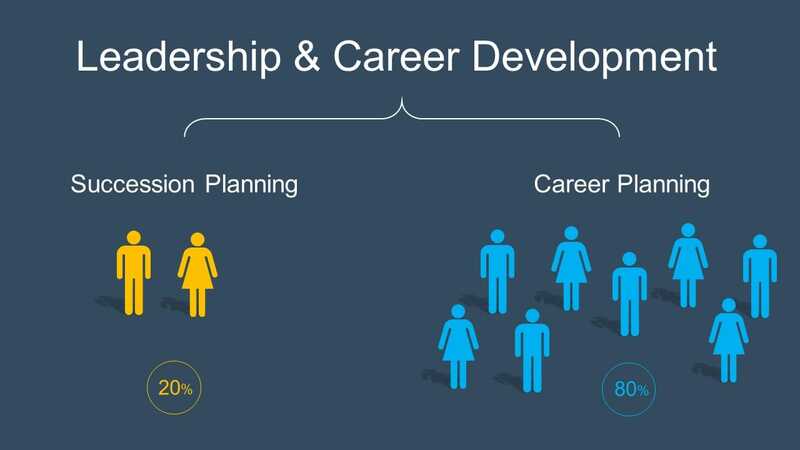 Organizations that are serious about career development make career development conversations a separate process. When they do, they signal to their managers that one of their key responsibilities is the development of their staff. Employees, in turn, get the message that their employer cares about them enough to develop them. Profit – What number are we trying to hit? Customers – What markets, customers and projects do we want to target? Products and Services – How are we going to attract our target customers? People – Who’s going to do all of this work? As I pointed out in this article, companies that order their priorities in this way are putting the cart before the horse. At the corporate strategy meeting, when the conversation finally turns to people, virtually all the time is spent talking about headcount. “HR, go find the people we need to make our strategy work!” the other executives demand. Now, if your corporate strategy is dependent on hiring a whack of entry-level positions, then maybe that might work. But that’s rarely the case. More often than not, achieving ambitious strategic objectives requires the addition of highly skilled technical experts, and highly experienced leaders. Good luck finding enough of those in today’s labour market conditions. Smart companies don’t leave their strategy to chance, and they don’t hope that they will find enough of the right kind of people. Smart companies know exactly how many people they have who are prepared, or being prepared, to take on critical roles, and when they will be available. And they know this before they sit down to discuss corporate strategy. They know this because they are constantly talking about their people in regularly scheduled “People Strategy Meetings” that precede corporate strategy meetings. 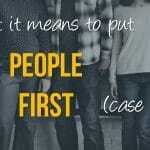 In other words, they put their people first, and position them at the heart of their corporate strategy. 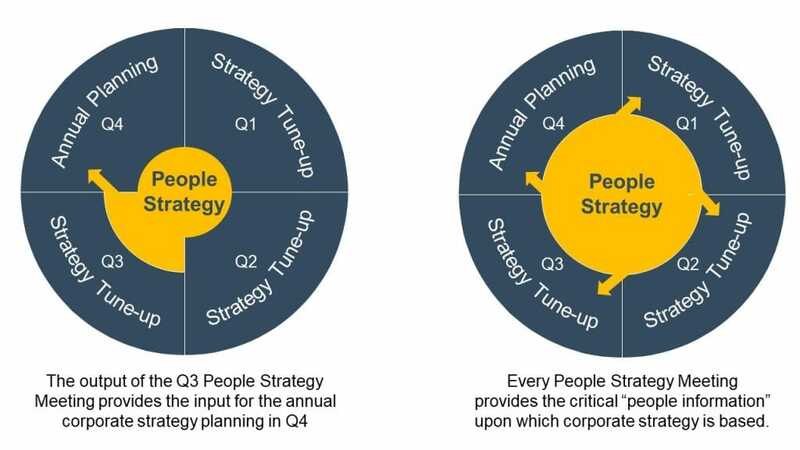 Ideally, corporate strategy will be done once a year followed by quarterly strategy tune-ups (strategy expert, Rich Horwath, details this process in his book Deep Dive). Prior to each quarterly strategy meeting, the “People Committee” meets to review their top talent and how they are progressing in their development plans. This gives the executive team precise information about the talent available to them when they discuss the feasibility of their corporate strategy objectives and milestones. What percentage of your workforce is languishing in career limbo, left with the distinct impression that if they want to advance their career, they need to go elsewhere? Whatever percentage you estimate, they represent the talent your organization is wasting. And it’s a good bet it’s those same people who are not engaged and productive in their work. Organizations don’t have to continue wasting their talent any longer. Lack of budget is not an excuse. Make leadership and talent development a top strategic priority and join the elite league of industry leading companies, who, not surprisingly, are also world-class talent developers.